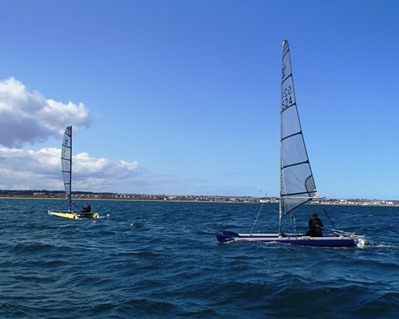 The NE coast at Bridlington gives the Catapult 2018 racing Programme its true open water sea sailing (along with the traditional hospitality offered by the Dinghy section of the Royal Yorkshire YC) and Brid delivered again across the B/H weekend. In Race 1 nobody spotted that the committee boat was drifting so all started on starboard but needed to tack onto port to get across the line. Gareth Ede tacked but didn't have time to get across in front of Alastair Forrest, so sat head to wind watching John Terry lead the rest of the fleet away up the beat. For Race 2, the fleet all decided on a starboard end start, given the lumpy sea and gusty breeze, but the port bias was still so extreme that only boats tacking onto port could cross. John gained by tacking early out to sea, gaining from stronger breeze at the expense of more tidal flow and the steep chop (followed by all the local Darts). Again, trapezing gave Gareth the advantage over the rest of the fleet, getting through the short sharp chop on the beat. Rounding the windward mark first, Gareth held this lead for both laps. George Evans pulled up to third, held around the course (shortened to two laps) ahead of Mike Gough who caught Alastair on lap two. Syd powered by Alastair on the final reach for 5th. Race 3 followed back-to-back, setting only two laps with late afternoon drawing in. Again the fleet started tightly on starboard in spite of the port bias. 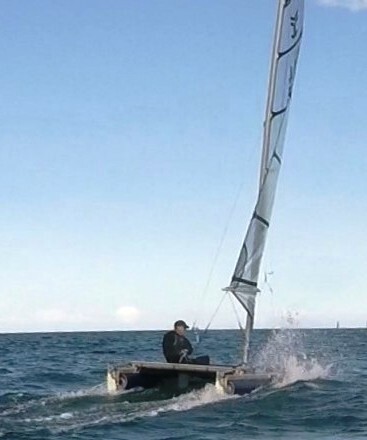 With the wind strength dropping, Gareth was able to trapeze less, and the fleet was more closely bunched on the first beat, helped by slack water. John had a good lead at the windward mark, but threw this away as he hesitated about which mark he needed to round next, gifting Gareth the lead which he held it to the finish for a third straight win. George again had the boat speed to hold third comfortably, ahead of Stuart. Sunday had a brisk SW wind, coming unobstructed by any land, and so bringing a steep sea It was forecast to rise, and so two races were booked with a 0930 start (!) to get racing in before conditions became unmanageable. 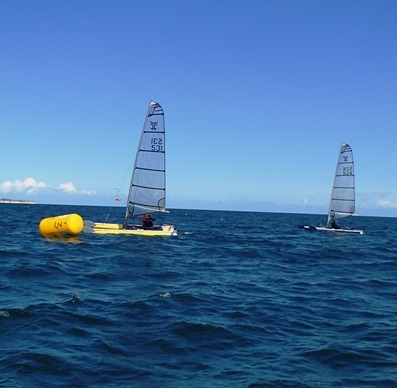 Two lighter helms tested the conditions and withdrew leaving a fleet of five. In the steep chop the priorities were keeping boat speed and attempting quick tacks, not at all easy or successful. Stuart won the Race 5 start with a well-timed run up to the committee boat end, with George and Mike cheek-by-jowl a couple of boats lengths to leeward. It was an exciting beat, with hulls flying as they crashed through and over the waves. Stuart was the first to tack inshore to find the layline for the windward mark, but Mike, who was by now drawing ahead of George, gained an advantage by tacking later, and rounded just ahead of Stuart. John had recovered from a poor start to overtake George, and rounded third. 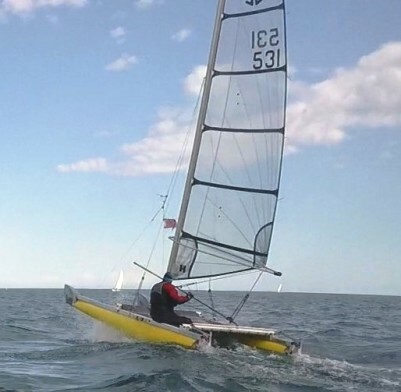 Stuart was on Mike�s heels as they rounded the leeward mark, but then fluffed a tack in the tricky conditions allowing Mike to get away and John to close the gap behind. John tried trapezing in the bumpy conditions and commented afterwards that it made things feel �much calmer�. He was right behind Stuart up the beat of Lap 2, and a tighter turn and gybe at the top mark, as Stuart went wide to avoid a Dart, gave him a couple of boat lengths edge over Stuart which he held to the finish to claim second place behind Mike. On Monday, the building westerly, whistling in the rigging, was off the land, giving a flat sea. With the wind due to rise, Joe Franks as RO (and Commodore) took his Dart out to test the conditions, and came back to say it was manageable. So the fleet pulled the boats across the sand to the water's edge in rising breeze, where more Darts and two Catapults went out, speeding upwind in the flat water but returning to report that downwind was precarious, and unsafe for racing. So the fleet pulled the boats back across the sand, disappointed but quietly relieved that racing was cancelled. Although Gareth had three straight wins, counting a DNS gave John a clear win as Northern Champion, and Mike Gough's places in the strong Sunday breeze lifted him to second. Handicap wins on Sunday gave Mike the countback decision over John with tied scores.